cream, whipped berries, sprinkles, decorative straws, etc. Blue Layer: Place all blue layer ingredients EXCEPT VODKA into a blender pitcher. Pulse to chop ice, then puree until mixture is smooth. Add vodka and blend until mixed in. Fill glasses 1/3 full of blue mixture and place glasses in freezer for 10 minutes, or until set and you're able to add the next layer without the colors mixing. White Layer: Place all white layer ingredients EXCEPT VODKA into a clean blender pitcher. Pulse to chop ice, then puree until mixture is smooth. Add vodka and blend until mixed in. Remove glasses from freezer and fill to 2/3 high with the white mixture, so now the blue is 1/3 and the white is another 1/3 of the glass. TIP: Pour white layer slowly over the back of a spoon onto the blue layer to keep the colors from mixing. 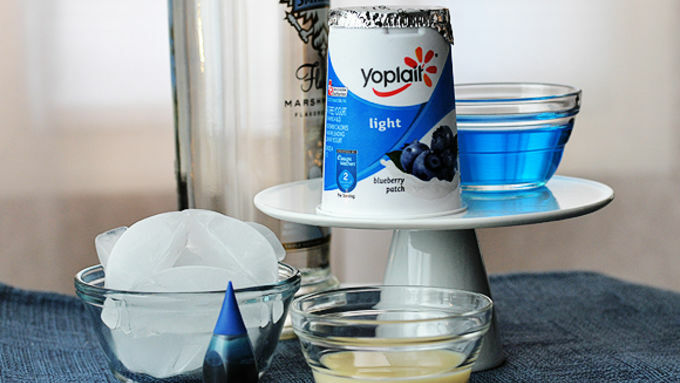 Return glasses to freezer for 10 minutes, or until set and you're able to add the next layer without the colors mixing. 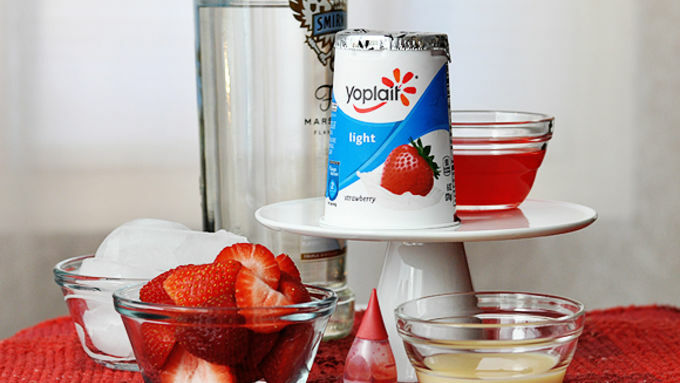 Red Layer: Place all white layer ingredients EXCEPT VODKA into a clean blender pitcher. Pulse to chop ice, then puree until mixture is smooth. Add vodka and blend until mixed in. Remove glasses from freezer and fill to the brim with the red mixture. TIP: Pour red layer slowly over the back of a spoon onto the white layer to keep the colors from mixing. Return glasses to freezer for 10 minutes. To Serve: Remove glasses from freezer and garnish with whipped cream, berries, sprinkles and decorative straws, if desired. Serve immediately! I used Fluffy Marshmallow flavored vodka in this recipe, but any flavored vodka will work -- cake, gummy, blueberry, strawberry, etc. Choose your fave! 2) Adjust vodka amounts according to your taste. Using two ounces vodka in each layer results in roughly one ounce per drink. I used one ounce per layer for a more subtle inclusion. 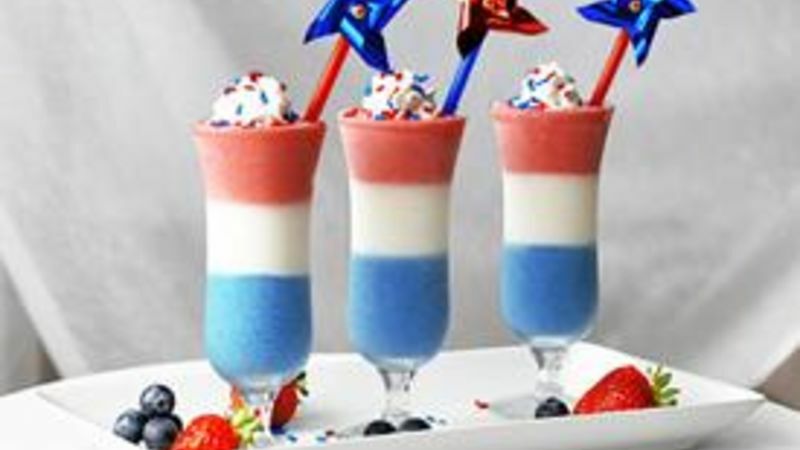 Boozy red, white and blue-sy slushies are the perfect companion to a great fireworks show. These slushies are the bomb -- really, don't they look like bomb pops in a glass? Blend these up and serve 'em as a prelude to the fireworks show. Plus, they're easy! I used Fluffy Marshmallow flavored vodka in this recipe, but any flavored vodka will work -- cake, gummy, blueberry, strawberry, etc. Choose your fave! 2) Adjust vodka amounts according to your taste. Using two ounces vodka in each layer results in roughly one ounce per drink. I used one ounce per layer for a more subtle inclusion. To make these drinks non-alcoholic, simply omit the vodka in the recipe. Serve immediately after pouring the final red layer on the top. (Alcohol keeps the slushies from freezing completely, but they will freeze more quickly and solid without alcohol in them.) 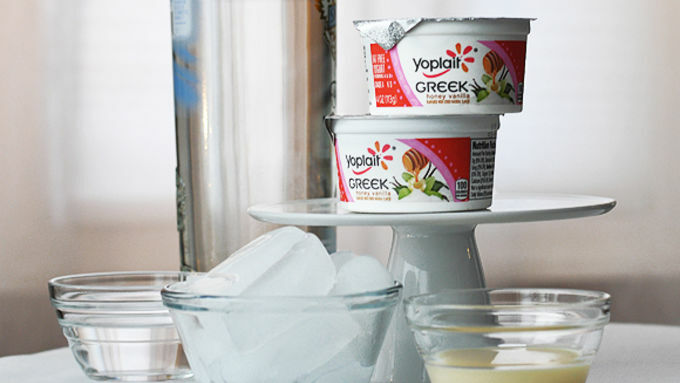 Pour it right up to the tippy-top of your glasses and put them back into the freezer for 10 minutes so they set up a bit before serving. Then just take 'em out and serve 'em up. Add whipped cream, sprinkles, fun straws or whatever your li'l patriotic heart leads you to plop on top. Happy 4th of July!